I have not done a movie review in a long time, but I just had to do so for this one. This is one of the best animated films I have seen since Up! I will try to keep this info spoiler free and only share what the trailers or other reviews have already revealed. I was not entirely interested in seeing this movie at first, but I'm a sucker for animated movies so I knew I just had to give it a chance. I'm so glad I did, because I think I would have kicked myself had I missed this on the big screen. Seeing it in IMAX 3D was just icing on the cake! Dragon takes you back to the time of Vikings, to a small village that is constantly being attacked by dragons. It follows the story of Hiccup as he learns that his village do not know everything about dragons and they might not be as bad as they think. 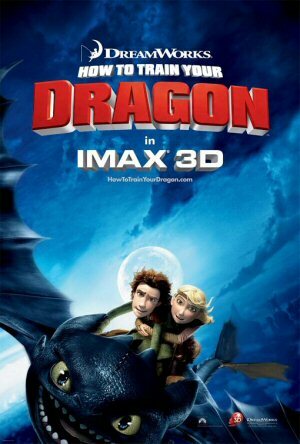 Hiccup grows close to an injured dragon and begins a new friendship. Telling his village about the truth of the dragons is a daunting task. During the whole storyline, you slowly see Hiccup becoming a man. He fights for what he believes in and finally earns the respect of the village and of his father. It's such a touching story with some funny moments. I definitely want to read the book it is based on. If you get a chance, please go see this movie. It's great for the young and old alike! Have you seen it yet? What did you think?